The World Radiosport Team Championship (WRTC) is a competition between two-person teams of amateur radio operators testing their skills to make contacts with other Amateur Radio operators around the world over a 24 hour period. All teams use identical antennas from the same geographic region, eliminating all variables except operating ability. WRTC2014 included 59 competing teams from 29 qualifying regions around the world. Competitors represented 38 different countries. View the complete results table. The September 2014 edition of the Potomac Valley Radio Club newsletter contained two articles about WRTC2014. Nate, N4YDU, wrote about his experiences as a competitor. Dave, K3ZJ, reported on his efforts as a site volunteer involved with the station setup and monitoring. 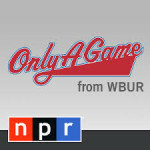 This event involved inviting the world’s best operators to the same geographic area (in this case, the Boston area), and setting them up with identical stations to create a level playing field. In other radiosport competitions, the contestants usually try to operate from locations with advantageous HF propagation in rare countries, with favorable local terrain (hilltops instead of valleys) and use the biggest antenna systems they can install and maximum power. However, for this event we wanted to test operating skill and had to remove all the other variables. 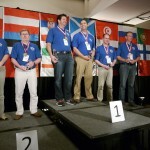 Two by two, competitors representing 38 countries were called to the stage at the World Radiosport Team Championship, held last month in Westborough, Massachusetts. They’re not identified by their names, which nobody knows anyway, but by their call signs. Organizers had already chosen the sites and raised the antennas. “It’s almost like we set the road course and now they’re bringing their cars and drivers and now they see what they can do,” said Randy Thompson, K5ZD, the co-chair of WRTC 2014. Bei der WM der Funksportler, die vom 12. bis 13.7.14 in den Neu-England-Staaten der USA durchgeführt wurde, können wir Deutschen auf ein hervorragendes Ergebnis zurückblicken. Manfred Wolf, DJ5MW, und Stefan von Balz, DL1IAO, konnten unter W1P durch hervorragende Logqualität die Bronzemedaille gewinnen. Zudem erhielten sie den Award für best Logqualitat (1,0 % Fehlerrate). Ray Lajoie, KB1LRL, one of the site team members for WRTC2014 was interviewed by the Mayor or Leominster. He talks about ham radio in general and WRTC2014. WESTBOROUGH, Mass. — Issued July 17, following the most internationally recognized competition in their history, the 2014 World Radiosport Team Championship (WRTC2014) announced the competition’s winners at an awards ceremony held Monday, July 14. Representing 38 countries from around the world, WRTC2014 included 59 competing teams from 29 qualifying regions. 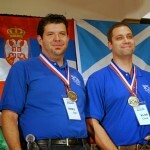 A team from the U.S. earned the gold medal, with teams from Slovakia and Germany earning silver and bronze, and a US. team taking fourth. Television video feature about WRTC2014. Includes interviews with W3IZ and IK2QEI. This year, the United States took Gold in the “Olympics” of amateur (ham) radio. At the end of the 24-hour competition known as the World Radiosport Team Championships (WRTC), three teams, representing three countries – the US, Slovakia and Germany – were awarded Gold, Silver and Bronze respectively. “This is a high-tech hobby. It used to be more popular before the advent of the cell phone,” explained local Ham-radio enthusiast and LATV volunteer Don Montrym, Thursday afternoon. Montrym spent time last week with The Champion, at Sholan Farms, explaining the competition, while watching a 40-foot antenna being erected by local volunteers. WESTBOROUGH, MASS. 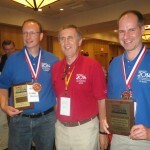 — A two-man team of Rancho Cucamonga’s Dan Craig and teammate Chris Hurlbut of Bozeman, Montana, earned the gold medal at last weekend’s 2014 World Radiosport Team Championship for ham radio enthusiasts. 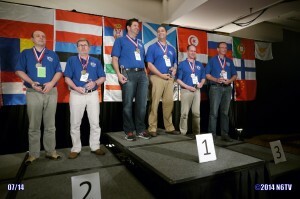 The pair won the gold medal in the competition that involved ham radio operators from 38 countries. Slovakia was second and Germany third. Craig (radio callsign N6MJ), and Hurlbut (KL9A), collected a score of 7,184,844 points, leading the 59 competing teams from the first hour, leaving little suspense for the gold medal, according to a news release.